"Elks Club Building Sign Jacksonville, FL" by George Lansing Taylor Jr.
Elks Club Building Sign Jacksonville, FL. 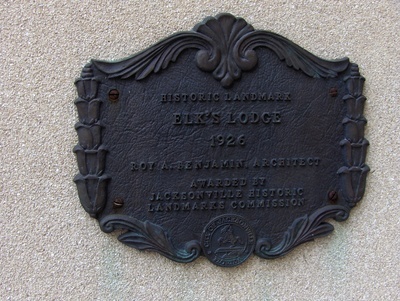 The Elks Club Building is a historic site in Jacksonville, Florida. It is located at 201-213 North Laura Street. As its name implies it was once a headquarters for the local chapter of The Elks. On March 9, 2000, it was added to the U.S. National Register of Historic Places, because of the historic influence of Elks establishments in the United States communities. This is was built in 1925-26 by Architect Roy A. Benjamin in the Mediterranean style This sign was awarded by the Jacksonville Historic Landmarks Commission in 1926.